AmpleHosting Review 2019: Is AmpleHosting a Good Hosting? Established in 2004, AmpleHosting offers shared and reseller hosting solutions to businesses in South Africa. The vendor also has a noteworthy presence in the United States, Nigeria, Spain, and Iceland. AmpleHosting is a South African-based web hosting company that has been in operation since 2004. Their servers and data centers are located in South Africa, though they also have a significant presence in the United States, Nigeria, Spain, and Iceland. 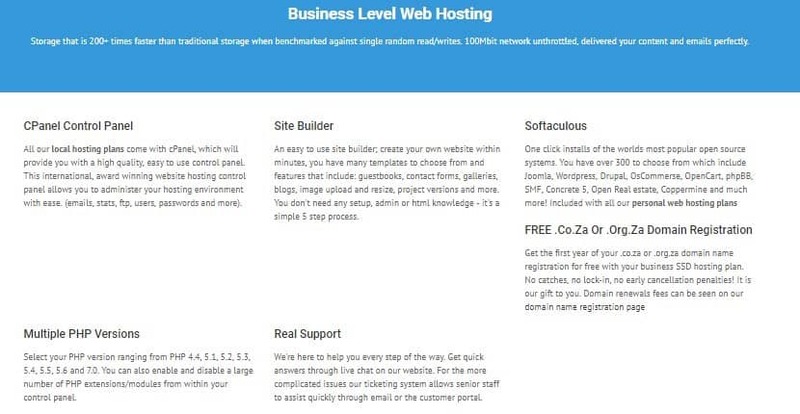 They are one of the top 20 biggest web hosting companies in South Africa by market share. AmpleHosting’s SSD shared hosting plans are threefold: B2, B3, and B4. B2 is their starter package. It comes with 7GB SSD storage space, 75 email addresses, 50 MySQL databases, and 2 sub domains. B4 is this vendor’s premium shared hosting package. It includes 50GB SSD storage space, unlimited email addresses, unlimited MySQL databases, and 10 sub domains. Unlike the shared hosting solutions that most vendors offer, AmpleHosting employs isolation protocols to ensure that resource hungry websites do not affect other websites hosted on the same server. Because of their decision to only offer SSD storage, the websites they host typically have faster loading speeds. AmpleHosting uses R1Soft to deliver better backups to their customers. They backup their client files every day at midnight for 31 days and users can restore the files in bulk or individually. AmpleHosting servers are monitored 24/7 to ensure that the system keeps running round the clock and that emerging issues are addressed promptly and effectively. That notwithstanding, it is not unusual for AmpleHosting’s servers to experience considerable downtime. Both their Reseller and Shared hosting servers often experience downtime, sometimes going down as often as six times in one week. In addition, they sometimes change backend settings without proper communication with customers, which can be quite frustrating. AmpleHosting’s cPanel is quite intuitive and easy to use, which makes their hosting attractive to beginners. They utilize the industry leading cPanel used by thousands of web hosting vendors worldwide. In addition, their website has a number of cPanel tutorials for clients who might need a little guidance on how to use it. Furthermore, the cPanel comes with softaculous one-click install with more than 300 preinstalled scripts making it easy and fast to get started even for novice webmasters. What’s more, users have easy access to email and database creation tools, mail delivery checks, stats, and FTP accounts among others. AmpleHosting hosting plans also come with a simple website builder that allows you to create a custom website even if you have no web design skills. AmpleHosting plans are competitively priced, aligning with the hosting rates of other vendors of its caliber in South Africa. They offer one free co.za or org.za domain when customers pay for more than three months. The domain remains free for as long as the user does not change their hosting plan and only for the first period of hosting purchase. During renewal, users pay the normal domain registration prices. This hosting company offers free content migration and has a 30-day money-back guarantee. However, users don’t get 100% refunds if they have been given a free domain; the domain registration cost is subtracted from the hosting plan fees. 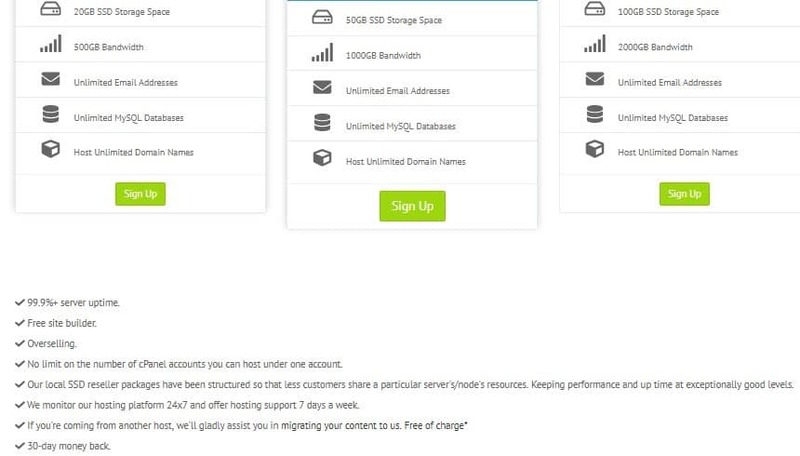 AmpleHosting does not charge for over usage, but requires the user to upgrade their account. I could not find any information on their website about the process of upgrading a website that is using more than the resources allocated for it. Webmasters can contact the AmpleHosting support team via email, live chat, and ticketing system, though phone support was discontinued in March, 2016. The support team is a big let down to their customers and is only available from 8:00 a.m. to 8:00 p.m. weekdays, and 10:00 a.m. to 6:00 p.m. during the weekends, South African Standard Time (SAST). They not only take long to reply to tickets, they also don’t seem to know much about hosting and how to solve most of the their customer queries. AmpleHosting live chat support is extremely basic, and they generally doesn’t allow customers to talk to their technicians. Their knowledge base, on the other hand, is fairly detailed but doesn’t include video tutorials. For companies looking for SSD hosting solutions at an affordable price, AmpleHosting seems to have the resources to deliver to their expectations. However, the vendor seems to have incessant server downtimes and their support team leaves a lot to be desired. Wondering how AmpleHosting stacks up against other Web Hosting companies? Enter any other Web Hosting company and we will give you a side-by-side comparison.